By sending this booking your details will only be sent to The Four Sisters and will never be shared with other third parties. By clicking this box you agree to the Terms and Conditions set out above. You can book to reserve an area of The Four Sisters for you and your friends. Just enter your requirements below to see what they have to offer. What did you think of The Four Sisters? Really great cocktail bar just off Upper Street. Great atmosphere, busy but not too crowded and great cocktails. Will definitely be back. Friendly bar staff, good atmosphere and an excellent espresso martini. Have come here before and will come again. Would definately recommend a visit! Came here for some bank holiday drinks with friends. Booked a table on the day and the staff member rang me as soon as they opened to confirm my reservation. Was very impressed as am used to being ignored in London where it's so busy everywhere all the time. The cocktails are delicious - not one was a dud. We mainly drank from the happy hour menu which was very varied - I think there were about 8 cocktails on there and they were all exciting and top quality - no long iced tea or anything like that! I would heartily recommend and will be going back very soon! Myself and 5 friends went to the Four Sisters for my 25th birthday and absolutely loved it. They were kind enough to reserve the lovely room towards the back of the bar for us which made it extra special as we had our own space for the entire evening. The cocktails were delicious and the service was great. It was so nice to go to a bar where the bar staff take a genuine interest in what you want and are more than happy to get creative with their cocktail making. The bouncer was lovely too which I always thinks makes such a difference to London bars. Over all it was the perfect place to celebrate my birthday and I will 100% be going back. Thanks again! We hired out the bar for our Christmas party in early December and I've had non stop praise that it was the best one yet. I do not doubt that a lot of that was down to a great venue, excellent cocktails and extremely hard working bartenders who despite being hammered at the bar, were thoroughly charming throughout the evening. The manager, Simon, was so helpful and on hand to answer all my silly questions, so there were no issues on the night. Would definitely recommend for a private party or even a few drinks with mates. We'll be back for sure! I came here with some friends one late Saturday afternoon/early evening and was so glad i have picked it to start off our evening. I had reserved an area and we were in the window with the big comfy sofa and large table. The cocktails were expertly mixed and i was particularly impressed with their espresso martini. It's a must visit and i have already been raving about it to my friends! Went to The Four Sisters last night and really enjoyed it. They've been closed recently for refurbishment and just opened again under new ownership (according to the sign in the window) so i was intrigued to see what had changed. The interior of the bar is largely the same to be honest, a few new pieces of furniture and some new paint but overall it was clean, comfortable and felt warm and welcoming. I loved the back bar, i think they had more bottles than they can fit customers! The drinks were the best bit though - probably how it should be in a bar! They are predominately a cocktail bar but they had a good selection of beers and a few bottles of ale in the fridge. My girlfriend had two cocktails, a Brandy Alexander and a Four Virgins, both of which were amazing and actually a good price for Islington / Upper Street. Overall both myself and my girlfriend thoroughly enjoyed the 'new' (but old!) The Four Sisters and would definitely recommend it. I really like this bar. Have been there the twice in the last two weeks and the staff are friendly, approachable and talkative. I wouldn't say I'm a regular but am soon going to become one. I don't drink cocktails so can't comment on those but they have a good range of beers and spirits for a small bar. It is intimate, understated and not trying to be something it's not - like a lot of the bars in the area. Only small criticism (hence the 4 stars instead of 5) is the place would benefit with a DJ and a space for people to dance - it would attract more people who go elsewhere for a boogie (yep, totally just said boogie). Definitely recommended. 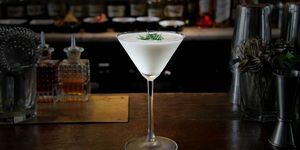 The great commentator, H.L.Mencken, observed: “The cocktail is the only American invention as perfect as a sonnet.” Canonbury’s The Four Sisters demonstrates, however, that the perfection of American cocktail-making can be equalled in London. Bar owner Simon Bastable and head barman Andre Marian have championed creativity and care. As a result, the venue has grown in popularity since its re-launch as a dedicated cocktail bar in October 2012. 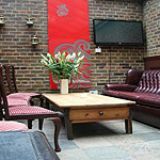 Four Sisters is conveniently located on Canonbury Lane, just off the lively nightlife centre of Upper Street and close to Highbury and Islington tube station. A black-painted and wide-windowed frontage proclaims the bar’s origin as a sturdy local pub, as does its narrow and compact interior. 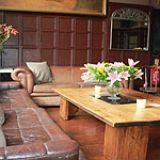 It has brown wood panelling on the walls and matching wooden floorboards. There’s a cosy and eclectic, pub-style jumble of upholstery-topped stools, chairs and tables, sofas, banquettes and framed mirrors. The single bar has an eye-catching rear set of shelving thanks to a kaleidoscopic array of bottles and containers. These include screw-topped kilner jars of maturing spirit infusions and colourful pots of home-produced syrups and mixers. 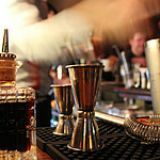 Impressive furthermore is the array of bartender’s tools that can be seen – shaker, strainer, muddler, tongs and all. Renowned comedian George Burns asserted: “Happiness is a good cocktail with a good woman,” and he reached 100 years enjoying the company of both. Likely a sign of the times, the civilised offerings and style of The Four Sisters seems more attractive to women - groups of girls come in frequently for a cocktail and a chat. 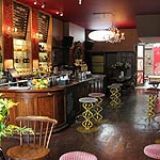 They join many male customers who include local residents and those working in Canonbury and Islington. There’s an attraction to all generations, but Friday and Saturday nights tend to be favoured by younger folk. Parties and get-togethers of up to 18 can be held in a discrete rear area. Although currently The Four Sisters doesn’t serve food, the nearby and highly-regarded Euphorium Bakery will provide any necessary sustenance. The cocktail achieved celebrity and notoriety during the arid and pernicious period of Prohibition in the United States. Ingenuity led to a remarkable array of colouring and flavouring syrups and mixers – plus mounds of crushed ice employed to mask the core alcohol from law enforcement inspection. Such ingenuity has continued to inspire cocktail creation and does so distinctively at The Four Sisters. The distinctiveness originates in great part from the complementary skills of Simon and Andre. Simon is an engineering graduate with a commitment to product excellence; Andre is a psychology graduate with an insight into human tastes. Their infusions and syrups are awesomely innovative: infusions include bacon-washed bourbon, apple- and pear-infused rum, chilli-infused vodka, lemongrass-infused gin, and orange- and blackberry-infused pisco. Beer syrup, rose syrup and chamomile tea syrup are just as imaginative. Availability of so many ingredients, spirits, infusions and syrups means that any cocktail can be created to suit personal requests. But the 27 cocktails listed are varied enough to please most punters. Soul Sister blends fig-infused bourbon, white chocolate liqueur, vanilla and rum syrup and cream, Trader Vic’s Mai Tai holds Havana Anejo Especial, orange curacao and almond-derived orgeat syrup and Coffee Cocktail belies its name by blending Martell VS, Carpano Antica, Cherry Heering, egg, vanilla and rum syrup. The cost of a cocktail is from £7.50 to £9 - great value for the quality. In addition, a happy hour until 7pm every day offers two house favourite cocktails (from a list of nine) for £10. These include such classics as a Singapore Sling with Bombay Sapphire gin or a Raspberry Russian with vodka. Cocktails make up 65 per cent of all sales. The wine list, however, is interesting, with whites including a Spanish Macebo and the iconic Argentine Torrontes; among the reds are a Cape Pinotage and a Spanish Rioja Reserva. Pricing is keen with bottles at £15.50 upwards. The draught beers are Leffe, Kozel, Peroni and Pilsner Urquell, while Stowford Press is the keg cider. 7 destinations curated by Samantha M.